Since becoming the Nebraska women’s volleyball coach in 2000, John Cook has led the team to four national championships, seven NCAA semifinal appearances, and the nation’s top winning percentage in women’s volleyball. In Dream Like a Champion Cook shares the coaching and leadership philosophy that has enabled him to become one of the game’s winningest coaches. Growing up in San Diego, Cook acquired his coaching philosophy from his experiences first as a football coach, then as a student of the sport of volleyball on the beaches of Southern California. After a stint as an assistant volleyball coach at Nebraska, he returned to Nebraska as head coach in 2000 and won the national championship in his first season. Even with a bar set so high, Cook saw at Nebraska’s tradition-rich program the potential for even greater growth and success. He decided to focus on higher expectations, training, motivation, goal setting, and other ways to build the strongest teams possible. In Dream Like a Champion Cook shares the philosophy behind Nebraska’s culture of success and reveals how he’s had to learn, evolve, and be coached himself, even in his fifth decade as a coach. With openness and candor he delivers insights about his methods and passes along lessons that can be used by leaders in any field. 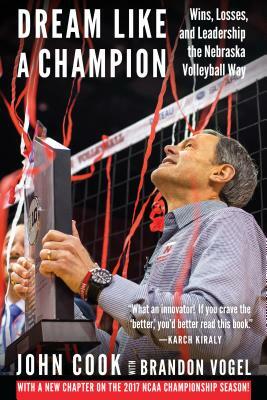 Cook also shares behind-the-scenes anecdotes about Nebraska volleyball moments and players—and how he coaches and teaches his players about life beyond the court. This paperback edition features a new chapter about the 2017 national championship season. John Cook is a two-time winner of the American Volleyball Coaches Association National Coach of the Year Award and was inducted into the American Volleyball Coaches Association Hall of Fame in 2017. Brandon Vogel is the managing editor of Hail Varsity magazine and has covered University of Nebraska athletics since 2011. His sportswriting has been featured by FoxSports.com, the Guardian, and CBSSports.com.